I felt like I needed a little something to liven up my outfit for wedding I was going to. 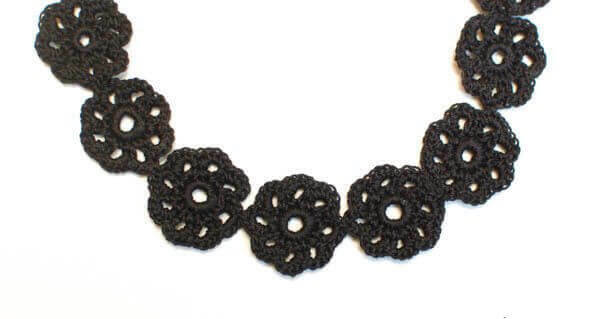 I wanted something simple, yet elegant, and envisioned this pretty choker. 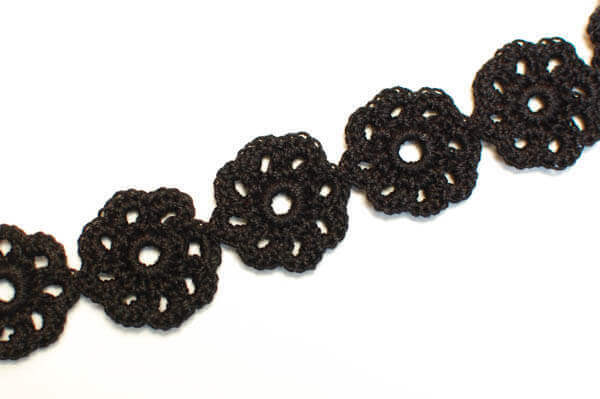 These are the same motifs I used in the Flower Bracelet that I made here. I love how it came out! Make 11 motifs, or the number needed to obtain your desired length. To join the flowers, you can simply sew them together with a needle and thread or you can use the join as you go method (JAYGO). For a “how to” on the JAYGO method, see my Flower Bracelet here. I only joined the flowers at one point for this. To fasten the choker around my neck I just used some of the thread to tie a simple bow at the back but you can also attach a jewelry closure if you wish. I could see adding some seed beads onto it to doll it up a bit. So pretty! I made it and I love it! It is a great little add on to any outfit! Thanks for the pretty necklace. This is so pretty! I’m pinning it!